Winter driving presents new challenges to even the most experienced drivers. Cold weather driving can be dangerous, especially if you live in Northern New Mexico where we get a bit more snow and ice than the rest of the state. Melloy Dodge has an excellent selection of four-wheel drive andall-wheel drive vehicles, which are better for acceleration and traction in inclement weather. However, often, the type of tires your vehicle is equipped with can make a huge difference. Most vehicles are fitted with all season tires from the factory. All season tires aren’t designed to handle extreme weather conditions. Think of all season tires like tennis shoes. They can be worn all year, but isn’t it better to wear sandals in the heat of the summer and boots for warmth and grip in the winter? Since all season tires are designed for use year-round, they sacrifice maximum summer and winter performance capabilities. It is much better to equip your car or truck with winter tires when temperatures drop. Winter roads are unpredictable. All season tires stiffen in the cold and are unable to provide adequate traction. 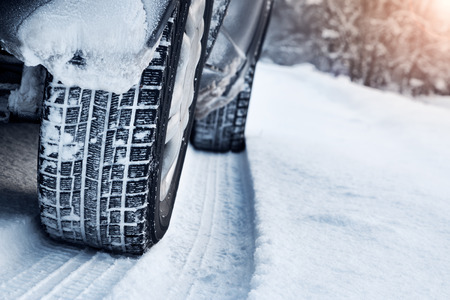 Winter tires are designed to provide supreme traction even in freezing weather. The tread of winter tires is able to stay flexible for added grip. Stop by the Melloy Dodge service department to get your vehicle outfitted with winter tires this season! No matter what kind of vehicle you’re driving, or tires it’s equipped with, Melloy Dodge wants you to stay safe. It’s important to be aware of your surroundings and drive carefully year-round, especially in adverse conditions.